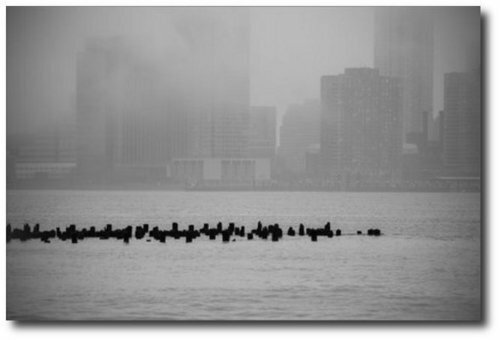 It shows the remains of pilings from long ago – a sign of how fervently New Yorkers have used their majestic Hudson River. The view seems to look back toward Midtown Manhattan. Or maybe it’s across to Hoboken, NJ. Hard to tell. Either way, the photo doesn’t catch any famous towers. Just the everyday buildings where people work and live. I like that. New York City has its share of famous vistas. More than anything, though, it’s where 8 million people live, work and have their being, not counting the throngs of people who take trains, buses and ferries in from other places to work here. This is a living city. In my mind, the city is an apt metaphor for faith. Ever-changing, restless, peering through mists, gaining clarity, then losing it; seeing majestic sights, then seeing the everyday; letting one’s eye get caught by the remains of another day, then turning to the dynamic now. The religious demagogues of our day probably never let themselves see the “misty.” They want black-and-white. They want a binary world: good or evil, their way or the highway. They can’t allow the shifts of perspective, the cycles of seeing and not seeing by which we draw closer to God. No shades of gray. No wondering. No doubt. I want a God who is larger and more dynamic than that.